Welcome to the home of Party Jumps on the web. Thank you for visiting our site. 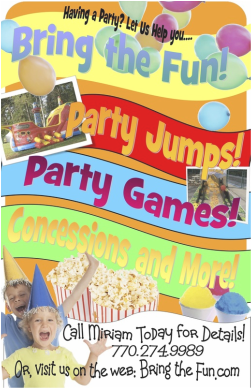 Party Jumps is a family owned company. We seek to provide safe and fun activities for all kinds of events. At Party Jumps we seek to make the experience as simple as possible. If you have any questions regarding our products and services, please feel free to contact us at Party.Jumps@yahoo.com or give us a call at either (770) 274-9989 Miriam or (404) 277-2929 Randall.